Back in 2014 a good friend loaned me his worn and much-loved copy of Patrick Rothfuss’ The Name of the Wind. By the end of the Prologue I was hooked. A few days later I was nearly half-way through NOTW and ran into that same friend at a social function. He asked me how I was liking the book. I replied I thought it was great, but I was concerned how Rothfuss was going to cram so much into Kvothe’s story in the remaining two hundred or so pages I had left. He explained to me that the book was planned to be a trilogy and, “Not to worry” because the second book had come out a few years ago, and the third was anticipated “Any time now.” Three years later, here we sit, still waiting for the Doors of Stone release date to be announced. On one hand, the wait is killing me. On the other, I love that the wait time between The Wise Man’s Fear and The Doors of Stone has created so much collateral art and culture around Kvothe’s story. I have to wonder, if we had gotten the instant gratification of an earlier Doors of Stone release date, would the rich body of fan theories, art, and music surrounding the KKC be as well-developed as it is? As the collective fan-base waits with ever increasing anticipation, that anticipation is matched with greater and greater creativity and analysis. Since Statsheep is a site focused on the ever-expanding media universe that is YouTube, I looked-into what YouTube had to offer the Kingkiller Chronicle’s readers. Not surprisingly, there are countless videos dedicated to the series. However, there are far fewer YouTube Channels with a sufficient body of work dedicated to Kvothe, the Chandrian, and the wider world of Temerant to warrant an article. I sifted my way through them like a dedicated fan-boy and selected my favorites. Below are seven YouTube Channels with great KKC-related content. Why seven? I don’t know, maybe because there are seven Chandrian? Maybe because Denna believes it only takes seven words to make woman love you? Anyhow, here are chaen-dian while we wait for Rothfuss to announce an official release date for the Doors of Stone. Yep. That’s Right. Everybody has their own YouTube Channel these days. That includes our friend Patrick Rothfuss. If you are a fan of The Witcher III: The Wild Hunt, then you are in luck. Most of the original content Pat has posted is a stream of him playing that game. There are also some family videos posted and Pat’s Ice Bucket Challenge (remember that). Unfortunately, if you are looking for that last, extra shred of KKC insight, or a nod to who Master Ash really is, you’d be better off searching the Eld. Pat does like/re-post a number of videos from other channels where he appears making this channel a valuable resource for finding his most recent appearances without searching. Further, there is a lengthy (hour +) video of Pat discussing the artwork for The Slow Regard of Silent Things that is worth a watch. What I like most about this channel is that these videos give some insight into Rothfuss as a person and as a family man. In our digital world we take this kind of opportunity for granted. Imagine though, if an equally large body of video of, say, J.R.R. Tolkein surfaced, literary historians would flock to it. When you think of it in those terms, it’s surprising he has so few subscribers (psssst, subscribe to Pat’s YouTube channel). One of the ironies of reading The Kingkiller Chronicles is that so much of Kvothe’s world revolves around his music, yet, we as the readers never get to hear it. We are left to imagine it. For those of us who are not musically inclined, this is a bit of a challenge. If you are Danilo Alimo, you just go out and play the Lay of Sir Savien Traliard to an audience of 122,000+ (and growing). That’s right. Mr. Alimo has built quite a following behind his music from and inspired by The Kingkiller Chronicles. Some of his pieces are original works designed to capture a mood, recreate a scene, or even build-out a character. Others are his own original fan-renditions. As I said above, one of the “good” things about waiting for the release of The Doors of Stone is how much fan-art the series has created. YouTube provides yet another medium for sharing this art in the form of music. Also, I should mention that Mr. Alimo’s work isn’t just run-of-the-mill “fan-art.” I may have given you that impression above. Alimo’s music does such a precise job of capturing the essence of Rothfuss’ characters that Pat has even re-posted some of his work on Facebook. If you are reading this post, chances are you are already aware that Lion’s Gate Films has purchased the rights to the Kingkiller series. News on the progress of this project is held about as tightly as the release date for The Doors of Stone. Therefore you can imagine my excitement when I stumbled onto Etowl’s channel simply by searching “Kvothe” in Google. Her video is one of the top-3 for that search term by-the-way. On her channel you will find several vignettes from the KKC. One of them centers on the relationship between Kvothe and Denna as described in The Name of the Wind. When I first saw it, it looked familiar, but it was so well done, I began to wonder if it wasn’t a re-post of something released by the folks at Lionsgate. On further inspection, a lot of the footage came from Pillars of the Earth. Nonetheless, her work is spot-on and includes such attention to detail (the clip where he’s handing her the newly-mended ring for example). There are many “trailers” for The Name of the Wind out there, but Etowl’s site has some of the best on YouTube. 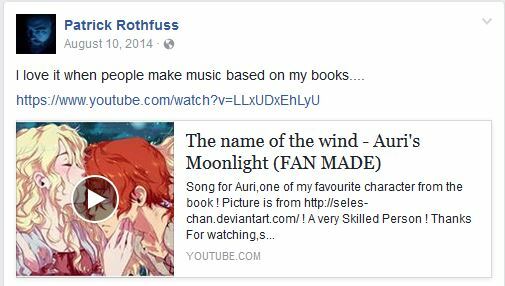 Patrick Rothfuss also agrees and has shared the video I mentioned above. Of the channels on this list, Merrigan probably has the least Kingkiller Chronicles related content. However, what she does have is tremendously creative, inventive, musical content. In fact, the haunting refrain of her version of Chandrian, Chandrian was stuck in my head the entire time I was researching this article. If you were hoping that the Patrick Rothfuss Channel on YouTube was actually just a bunch of interviews with him about his books, don’t worry. There is a channel like that. It’s Orion Publishing Group. In fact, they have a lot of great content from all of their writers. However, since you are reading this article, on this topic, I’ll save you the trouble and provide a link to just Pat’s content here. When The Doors of Stone comes out, I assume you’ll find something on this channel about it. The biggest jewel of the whole channel are the interviews with Pat on The Name of the Wind. It’s hard to believe that the video was posted nine years ago. It’s also hard to believe that Pat’s beard was that short! That means we’ll have been waiting over a decade to find out how Kvothe became Kote when the last book is published. Still, if you love learning about the literary creative process, or want to know more about how Pat’s life influenced his work, this is a great channel to check-out as we wait for the Doors of Stone release date. Yes. That is correct. From the Prologue to the Draccus, pretty much every major plot-point in The Name of the Wind has been given a musical score by Mark Haas. When I say musical score, I am not using hyperbole. Now you can play ambient music while you read to further help you set the mood for the first book. Is Kvothe’s time in Tarbean not depressing enough for you? Play this on a loop while you read it. Not scared enough of the Chandrian? Try adding this in the background as Kvothe stumbles through the campsite on your next read-through. Rothfuss’ marvelous writing should be enough to satisfy any reader. However, if you are looking for a unique, multi-sensorial experience, Mark Haas’ music should be a terrific add to make The Name of Wind feel new while you wait for The Doors of Stone. WorldbuilderInc: They raise money to support Heifer International (which is an AWESOME non-profit) and attract viewers to their site by having an absolute goldmine of fantasy literature content. From what I’ve seen on Reddit, there is a surprisingly large number of KKC fans who only listen to the audio books. If you never have, then how do you know you are pronouncing things correctly? Well why not listen to Pat read them to you on Worldbuilders’ YouTube channel. The channel includes a number of other cool KKC-related features both including and not including Rothfuss himself. Some of my favorites include the video of Rothfuss explaining and playing Tak and that someone apparently made a drink recipe and named it after Auri. I sure hope they can factor worth a damn. I don’t know anyone who has read the KKC and not wanted to immediately devour The Doors of Stone after Kvothe’s last, perfect step at the end of The Wise Man’s Fear. However, so much collateral fan-art has been created out of the series that it is almost worth it. The time between books has allowed us to cultivate so many cool theories, develop such awesome artwork, and write moving music. The wait is killing me, but it’s giving a life of its own to KKC fandom. The people who read the series after The Doors of Stone is released won’t be able to experience the series the same way we have. They won’t have a reason to scour the internet for secrets and theories — they’ll have instant gratification. They’ll have answers. For those of us who have been waiting a long time, at least there is a support group of many other awesome and talented fans to help us pass the time.